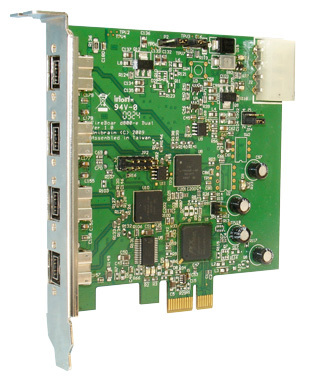 New generation Texas Instruments XIO2200A integraded PCI Express to PCI Bus and 1394 PHY/Link controller. 2 FireWire ports with up to 400 Mbps throughput. Big IDE’ internal power connector. This board is delivered with a built-in hardware key that unlocks Unibrain’s ubCore drivers and acts as a license for FireAPI Development Toolkit. 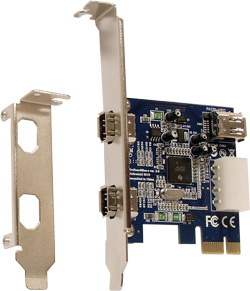 Fireboard800-e Pro DualTM is a four (4) port, dual bus PCIe host adapter ideal for multi-camera acquisition systems that require fast and reliable data transfers to the host system. 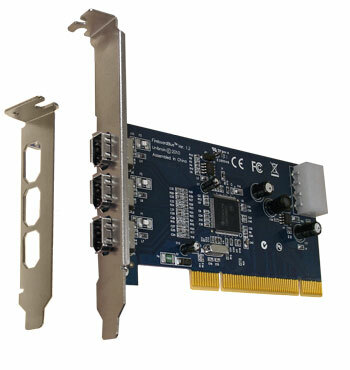 The card allows simultaneous image acquisition from up to 16 cameras at total data throughput of 160 MB/sec using a single x1 PCIe slot, and utilizes deep isochronous FIFOs that guarantee an uninterrupted data flow.